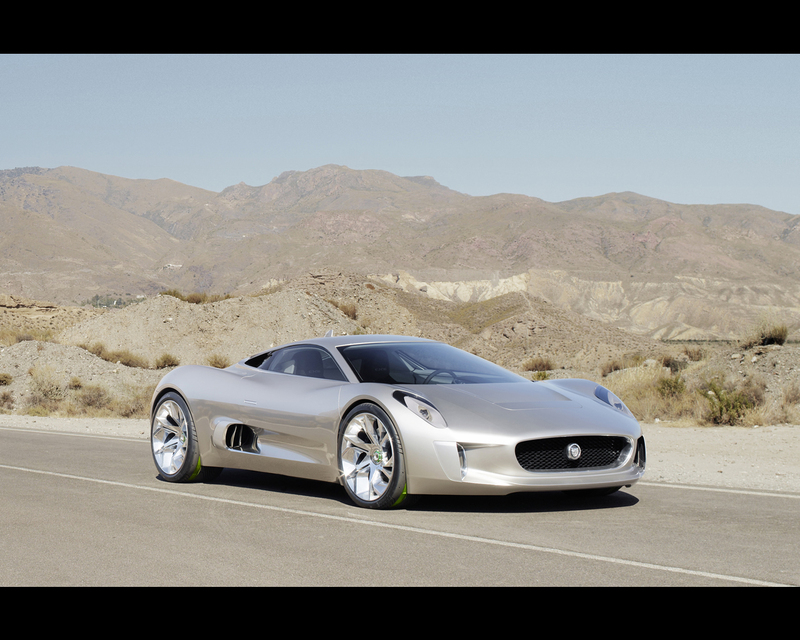 Jaguar C-X75 Concept 2010 - Plug-in electric car with Gas turbines propelled range extender. 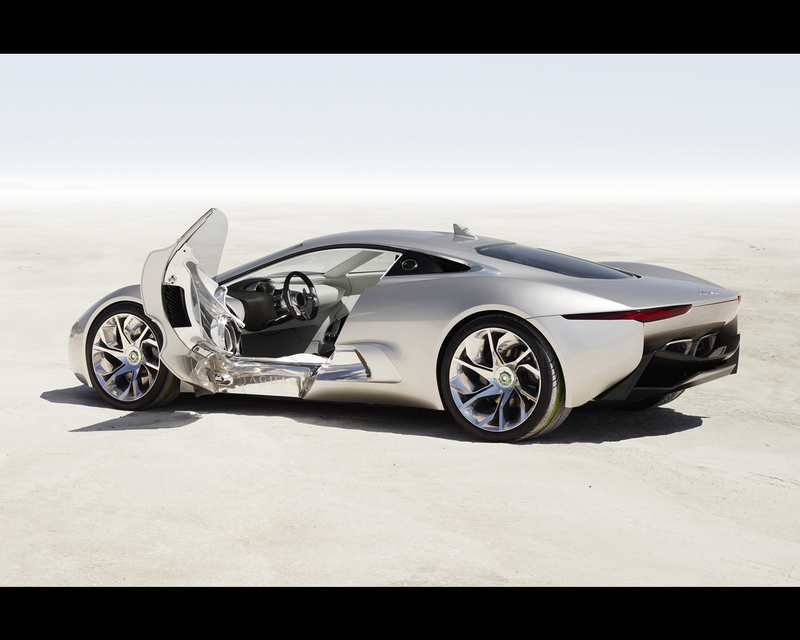 The C-X75 concept is both a celebration of 75 years of iconic Jaguar design and a look into the future of automotive technology. 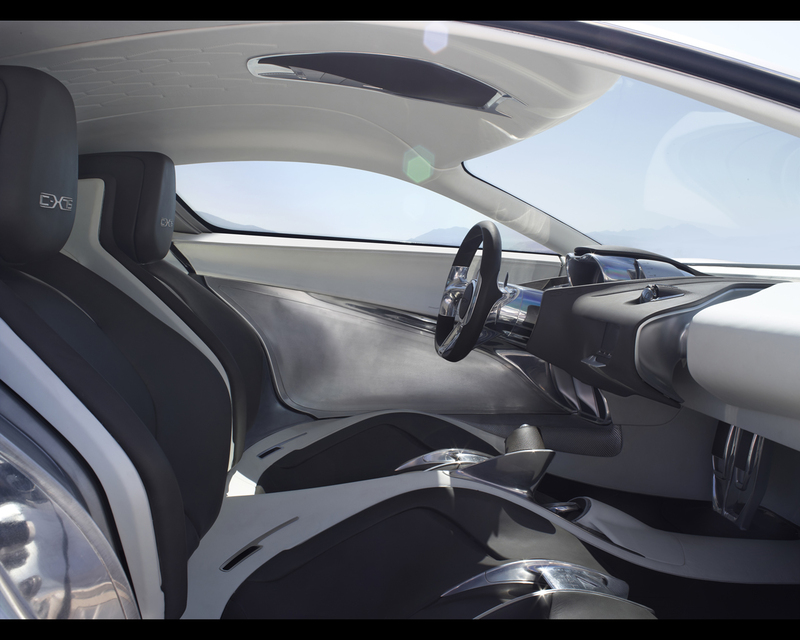 Designed as a range-extended electric two-seater supercar, it explores the outer limits of both performance and sustainability. With plug-in capability the car can achieve a zero tailpipe emissions range of 110km (68 miles) when running under battery power alone, plus a potential top speed of 330kph (205mph) and blistering acceleration. 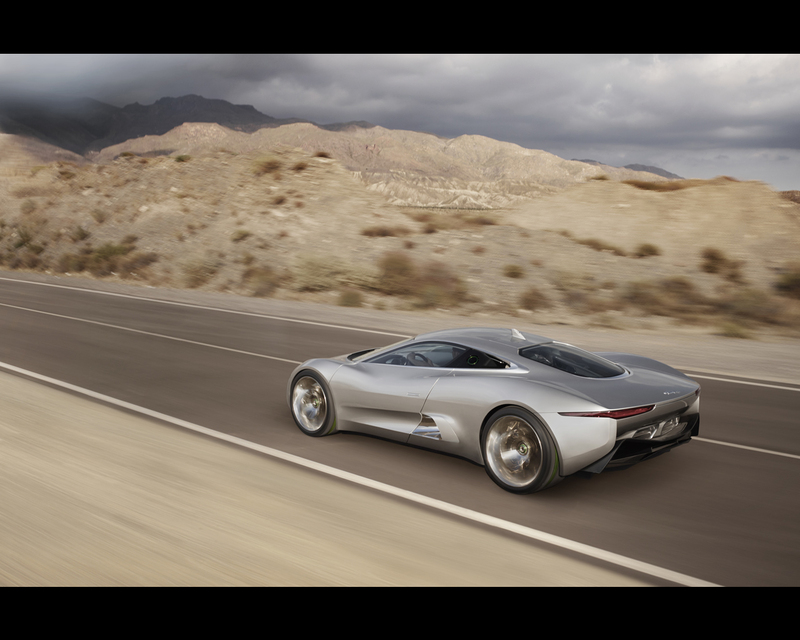 The car demonstrates that it is possible to retain Jaguar’s core values of performance, design and luxury using technology that will make environmentally responsible performance and electric vehicles a practical proposition. The C-X75’s 580kW (778bhp) propulsion system combines powerful 145kW (195bhp) electric motors at each wheel for outstanding performance. At the center of the car sit state-of-the-art, mid-mounted micro gas-turbines. 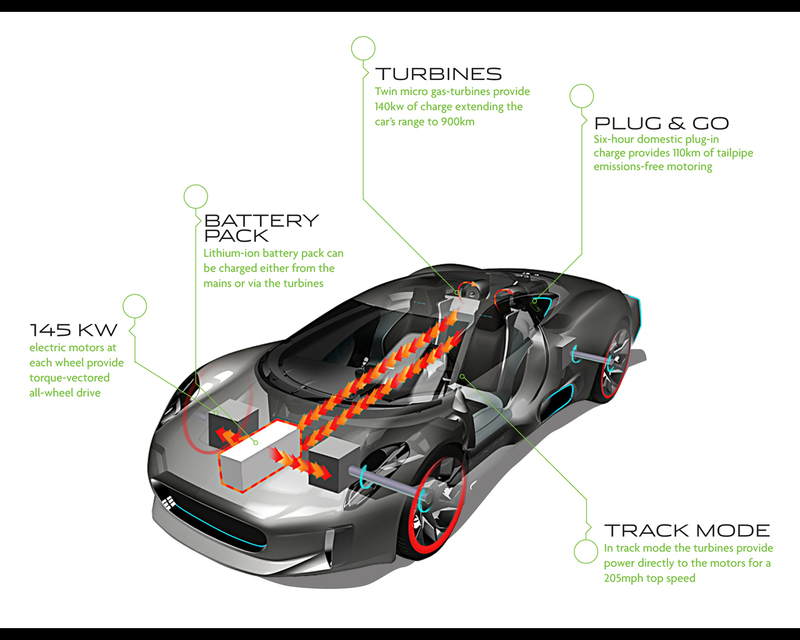 These can either generate 140kW (188bhp) to charge the batteries and extend the range of the car to a remarkable 900km (560 miles) or when in Track mode provide supplementary power directly to the electric motors. 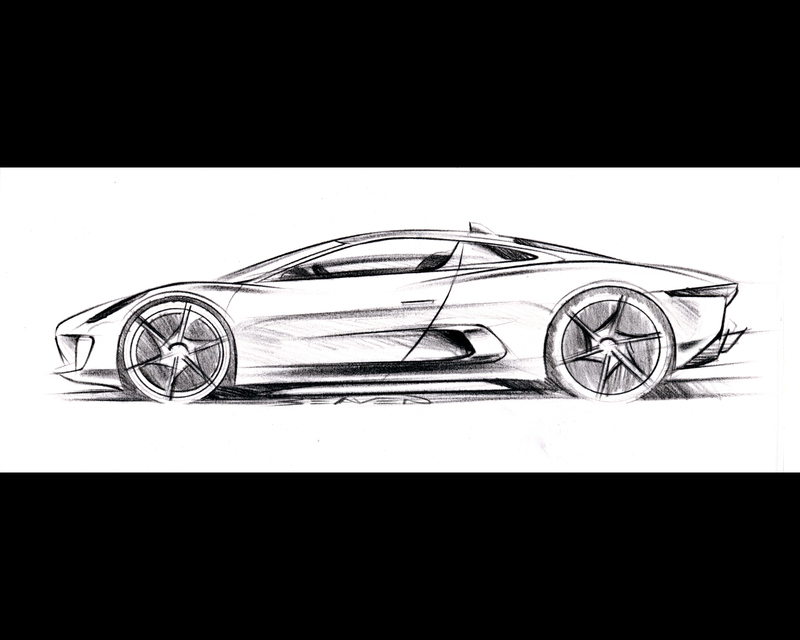 The four electric motors provide torque-vectored, all-wheel drive traction and grip, essential in a car that produces 580kW (778bhp) and 1600Nm (1180lb ft) of torque. 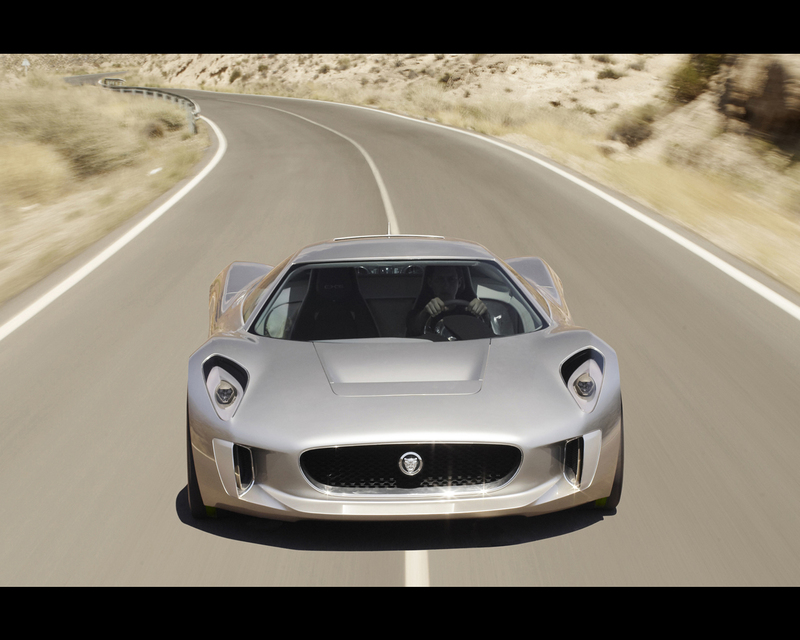 The Jaguar C-X75 is a high-performance demonstration for future technology and innovation. 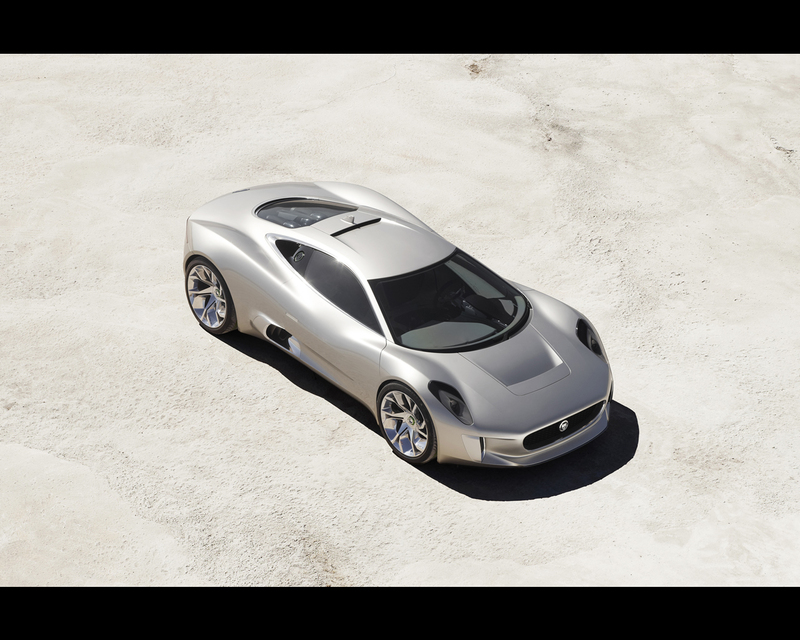 The 330kph (205mph) four-wheel drive supercar is capable of reaching 100kph (62mph) from rest in 3.4 seconds with zero tailpipe emissions during urban use. Even in range-extending mode it emits just 28 grams of CO2 per kilometer thanks to its efficient micro gas-turbines which provide charge to four 145kW (195bhp) electric motors. Turbines offer a number of advantages over a reciprocating piston engine when powering range-extending generators. With fewer moving parts and air bearings, turbines do not need oil lubrication or water-cooling systems, all of which offers considerable weight-saving benefits. They can also be run on a range of fuels including diesel, biofuels, compressed natural gas and liquid petroleum gas. 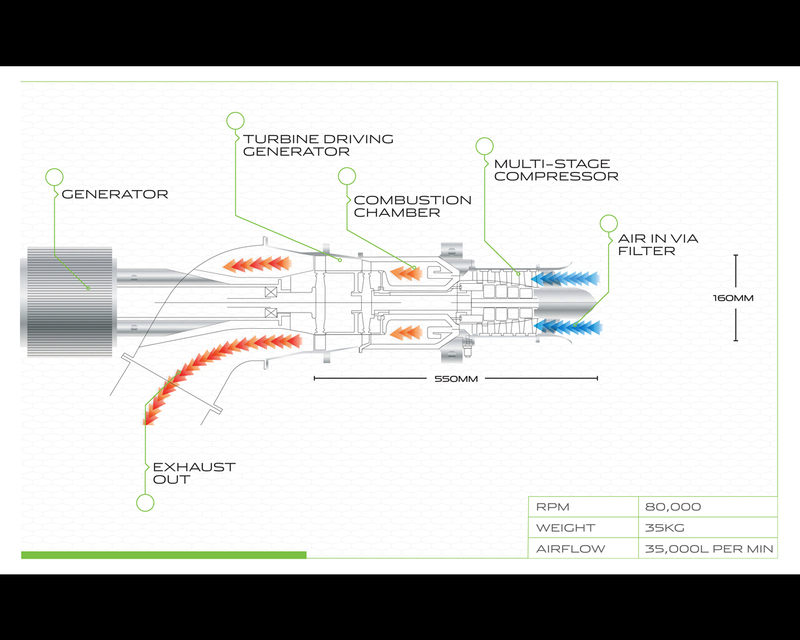 Also, turbines reach their optimum operating speed and temperature in seconds and so can be used in short bursts to top up the batteries without compromising fuel consumption or life-cycle. Coupled to two switched reluctance generators supplied by SR Drives, the turbines operate either in sequence or together, depending on energy needs, to swiftly and efficiently charge the batteries – or provide power directly to the electric motors – as dictated by the propulsion system supervisory system. 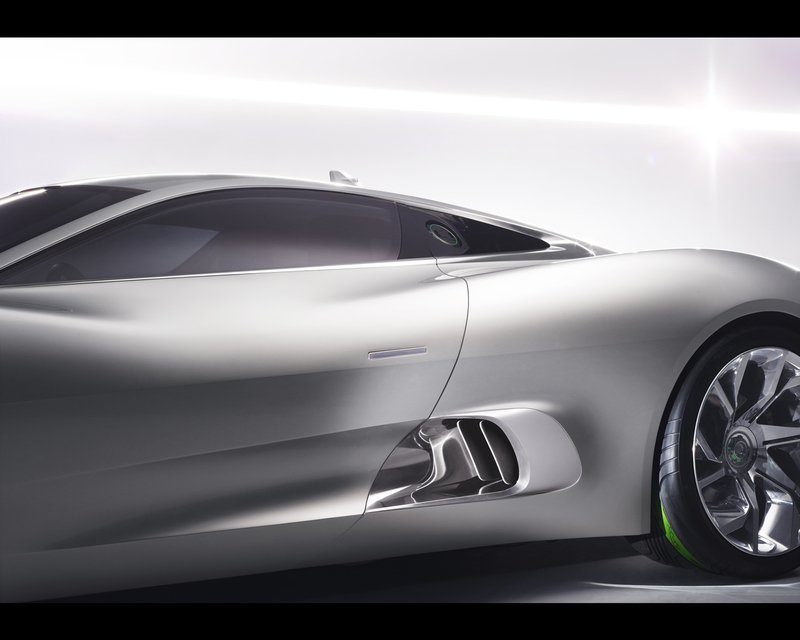 Aerodynamics have always played a large part in Jaguar design with legendary designer Malcolm Sayer elevating it into an art form in cars such as the XJ13, the prototype from which the C-X75 draws inspiration. 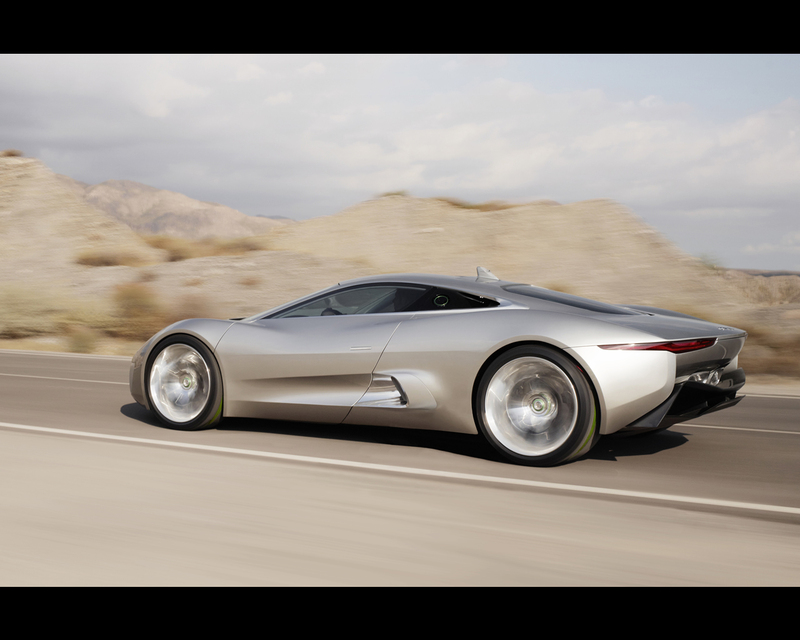 Today Jaguar is aiming to reduce the drag coefficient of its future models in order to increase fuel efficiency. The C-X75 presented the additional challenge of managing the high volume of air required by the turbines. 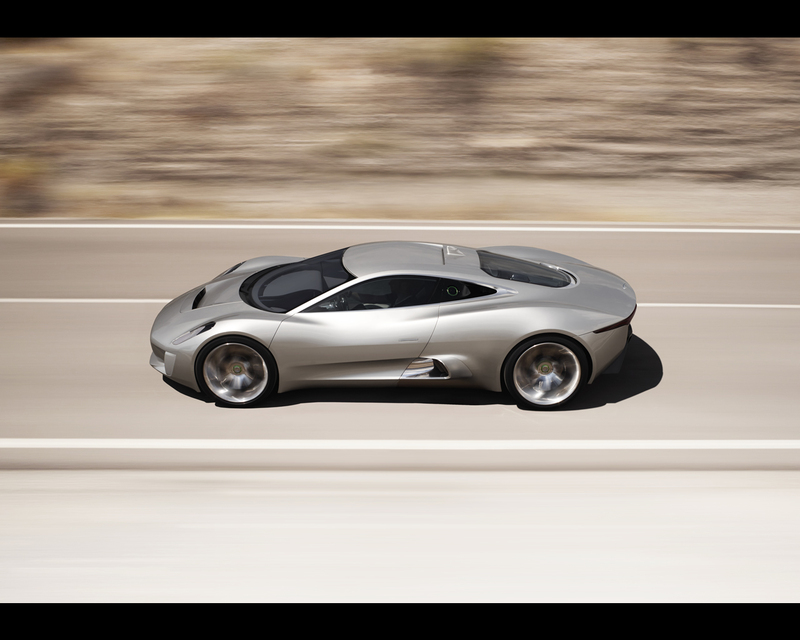 To achieve this active aerodynamics have been utilized for the first time on a Jaguar. 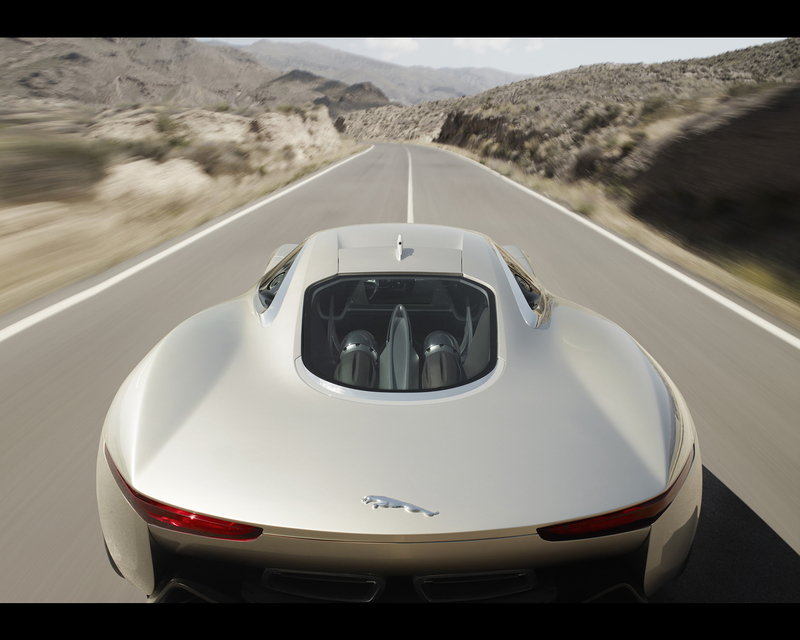 By opening the front grille and brake cooling vents only when necessary, Jaguar has increased the design’s aerodynamic efficiency dramatically. 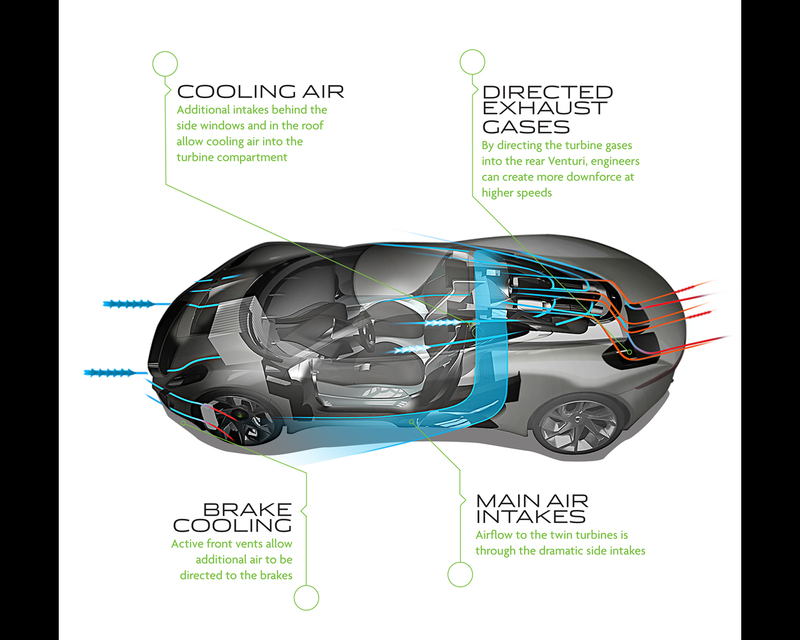 At the rear corners of the car vertical control surfaces automatically engage at higher speeds to direct airflow aft of the rear wheels for increased stability and efficiency. 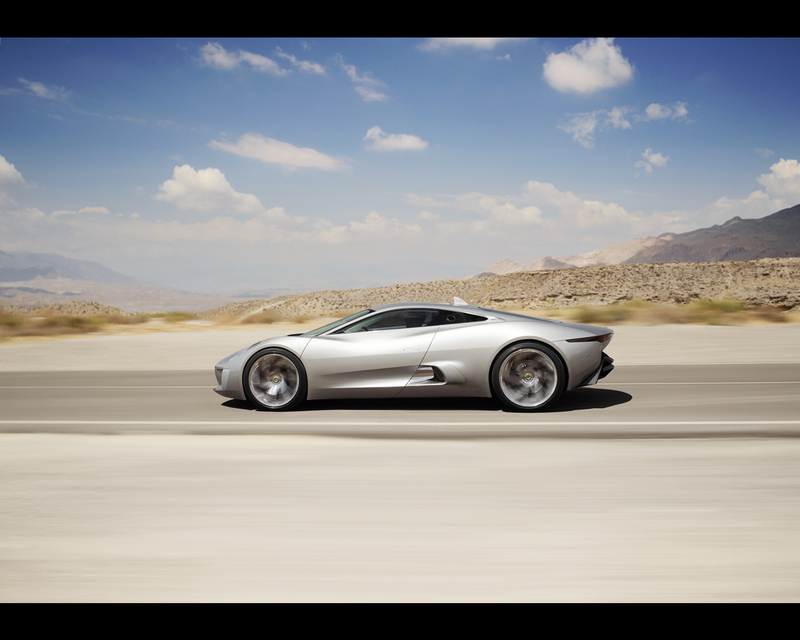 Wallpapers: Jaguar C-X75 Concept 2010 - Plug-in electric car with Gas turbines propelled range extender.